Featuring lifelike body patterns, flash-creating skirts, concealed double sharpened hooks, good and lifelike performance in water, including 5 assorted fishing lures, 2 line leaders, this set is a wonderful for fishing lovers. Lifelike lures with bright colors, vivid body patterns. Some with bright skirts to create flash that attracts predators. Double conceal carbon steel hooks increase hook up probability. Weighted lead on belly makes it stay at approx. 45 degree in water. 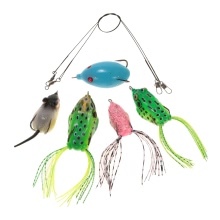 Include 5 assorted lures, 2 line leaders. Well preserved in an organized clear box. Note: The item colors maybe slightly vary from the picture due to different production batch.